It is amazing how many Protestant and Evangelical Christians in the West are acquainted with the name Horatio Gates Spafford, and especially the story of how, spurred by a profound personal tragedy, he penned the words of the much-loved, inspirational hymn “It Is Well With My Soul”. Not so many, however, know “the rest of the story,” unaware of how, out of the grief and subsequent searching that he and his wife Anna experienced, an unusual community grew and thrived for several decades in the Holy City of Jerusalem. It is fair to say, I think, that both expressions–the hymn, and later the community–sprang in some measure from a common root, that of wrenching personal trials. In any event, here is the account of how Horatio’s famous hymn came to be, plus bits of context and analysis that will hopefully shed additional light on what is arguably the most enduring facet of Mr. Spafford’s legacy. As the 1870s began, Horatio Spafford was a successful Chicago lawyer, and enjoyed all the trappings such a life offered. With a growing family–a wife and four little daughters–and a comfortable home in the fashionable suburb of Lake View, he was respected as a churchman and a community leader, and also heavily invested in the city’s speculative real estate market. Then, a series of events conspired to shatter the family’s cozy existence. First the Great Chicago Fire of 1871, and then the economic crisis known as the Panic of 1873, left Spafford in difficult financial straits, mostly unknown to his wife Anna. In response to the fire, Horatio and Anna nonetheless participated in the relief efforts for the victims, charitable work that foreshadowed their future life in Jerusalem. Despite these setbacks and demands, late in 1873 the Spaffords planned an extended vacation trip to Europe, reserving passage on the luxurious French liner SS Ville du Havre. When Horatio was detained by business at the last minute—an offer on one of his investments—they decided that the rest of the family would sail ahead as planned, and he would join them later in France. However, on November 22nd, 1873 one of the great unexplained tragedies of the sea took place: About 2 a.m., on a clear, calm night on the open sea, the Ville du Havre was rammed and nearly cut in two by the iron-hulled English sailing vessel Loch Earn. Amid the confusion and hysteria on deck, the passengers and crew found many of the lifeboats and life preservers stuck fast and unusable, everything having been newly-painted. 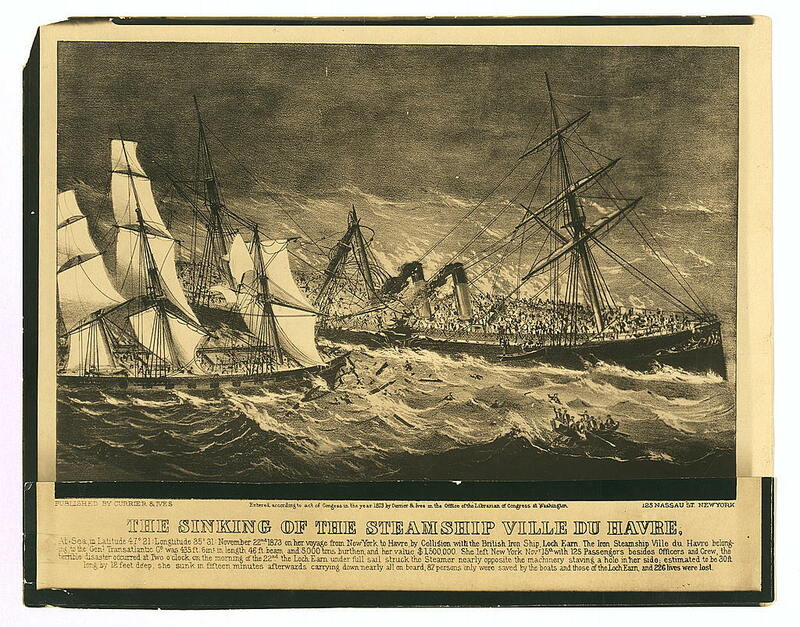 In only 12 minutes, the Ville du Havre broke apart and sank beneath the waves. As the waters swirled about her, Anna Spafford felt her four little girls, the oldest 11 years old, torn from her grasp by the turbulence and the numbing cold. After an hour Anna found herself in a boat, bruised and sick with seawater, but safe. She had been found floating unconscious, they said, supported by a piece of debris. She knew instinctively that all of her children were gone. Indeed, from the entire ship 226 had been lost and only 57 saved. Once ashore in Wales, Anna’s brief, poignant telegram to Horatio conveyed the profound tragedy they had suffered: “Saved alone. What shall I do?” Spafford cabled back for her to proceed to Paris where they had friends and he would join her as soon as possible. Horatio was a writer of poems and hymn-texts throughout most of his life, but so inspired were these particular lines, and the three stanzas which followed, that Spafford set them down in a single, unaltered draft, almost exactly as they have appeared in countless Christian hymnals down through the years. It seems that Horatio Spafford—faced with such great loss, and wrestling with the question of “Why?”—had already begun to emerge with a faith in the ultimate goodness of the Almighty. The hymn, as an expression of a sublime confidence in God that transcends all circumstances, has had an incalculable impact over all the years since. For me, be it Christ, be it Christ hence to live. Now, I had always reckoned that the “sea billows” of the first stanza was the hymn’s only possible (but still indirect) reference to the shipwreck. But here, the line If Jordan above me shall roll I find curious and quite striking. The idea of crossing over Jordan (as in the Bible) is, of course, a well-known metaphor for the experience of death: the end of one’s burdensome wanderings and the joyous entry into a Promised Land. Then there is the spiritual “Roll, Jordan, Roll” (originating with Charles Wesley and later appropriated within American slave culture as a coded message for escape). In fact, the writers of many hymns and songs have used the Jordan as a word-picture. Spafford’s turn of phrase, though, is rather different. Think about it: If the “Jordan”, a river, is rolling “above me”– then where am I ? The logical answer is: under the water. Then, in the very next line, “death” ensues, depicted as painless and peaceful. One runs the risk of being too analytical here, of course. On the other hand, knowing the larger, tragic context of the original hymn’s writing, the image could be viewed as a rather dark and chilling one. The fact that this stanza was sung by Colony members in Jerusalem suggests to me that the words indeed pointed somehow to the Spaffords’ profound tragedy, the drowning of their four daughters. It occurs to me also that another hymn (bear with me! )–an earlier one, and widely published–contains very similar language. Of this hymn’s final stanzas–which unfold themes of darkness, grief, sorrow, death, and ultimate release–one contains the line when death’s cold, sullen stream shall o’er me roll. The hymn is “My Faith Looks Up to Thee”, published already in the 1830s, and thus definitely known to Spafford. It remains a standard in Protestant hymnals to this day. Now, thought questions: Did this earlier hymn inform Spafford’s poetic sensibilities? Did publishers think Spafford’s language too similar and thus reject that particular stanza of his? Or, did they perhaps judge his imagery too pointed and intense, and for that reason relegate it to obscurity? 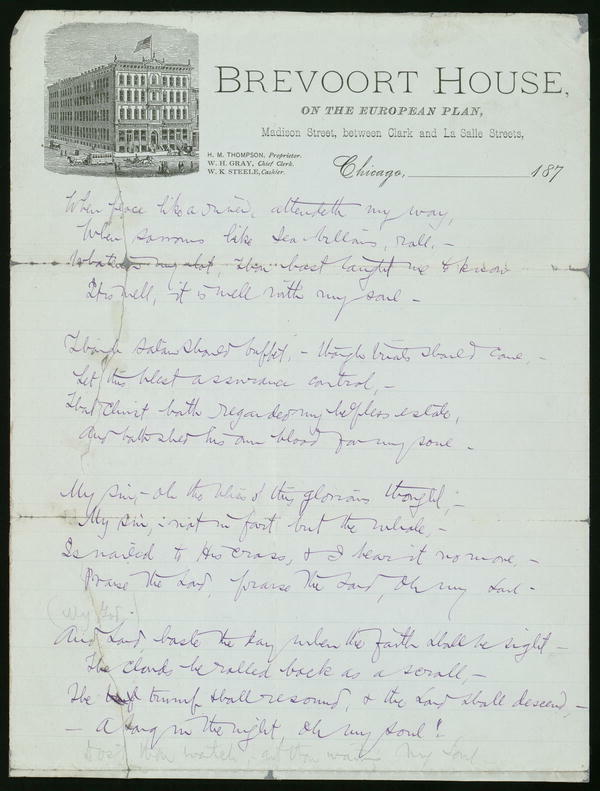 In any event, within a few years of it’s writing, Spafford’s text was set to music by Philip P. Bliss (1838-1876), who gave his tune the name Ville du Havre, after the ship that had carried so many to their deaths. 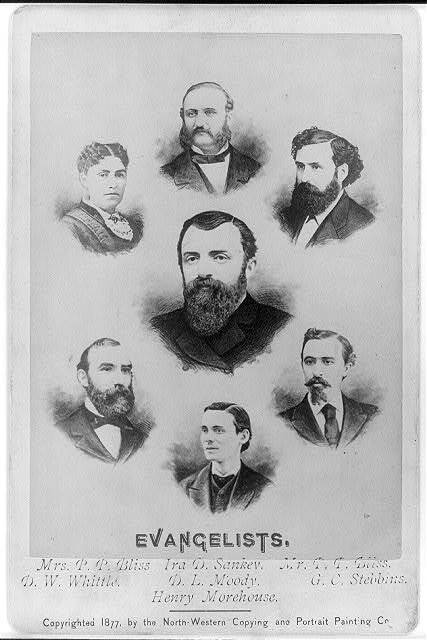 It is interesting that Bliss and Spafford in fact knew each other, with the common connection being the Chicago-based evangelist Dwight L. Moody. Not only was Spafford a friend and early financial backer of the up-and-coming preacher–at a time when Moody was still supporting himself selling shoes–but, as Spafford’s daughter Bertha wrote, “the group of evangelists and musicians who gathered about Mr. Moody often met at our home in Lake View for conferences and discussions” (Vester, Our Jerusalem). Horatio Spafford was also active in Moody’s jailhouse ministry, would preach on occasion, and once traveled to England to assist in one of Moody’s crusades. 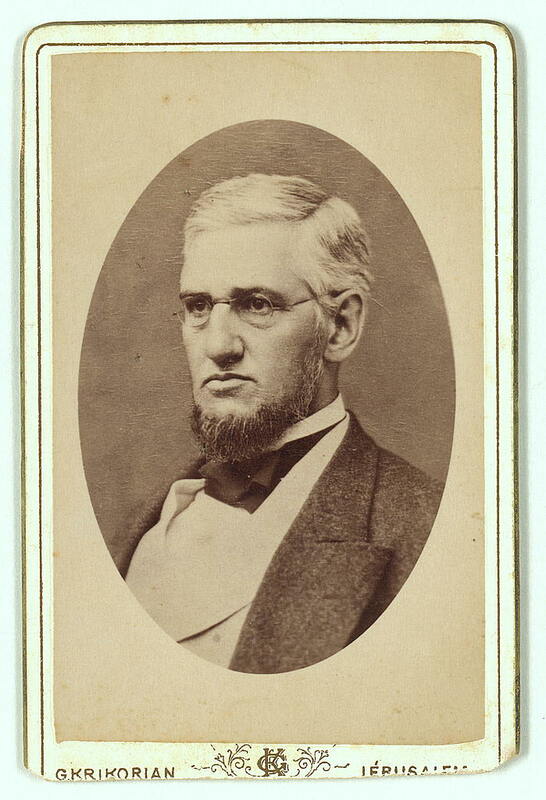 The musician Philip Bliss was associated with Moody as early as 1869 and became a full-time evangelist in 1874, so he–along with the likes of Ira D. Sankey and George C. Stebbins–was very much a part of the same Chicago evangelical milieu as Spafford. “It Is Well With My Soul”–Spafford’s text and Bliss’ tune–were first published in Gospel Hymns No. 2 (1876), compiled by Sankey and Bliss in collaboration. That same year, 1876, Bliss himself died a tragic death when both he and his wife perished in a train wreck in Ohio; he was only 38 years old. Moody, for his part, was involved with Horatio and Anna at various critical junctures. During the Spaffords’ journey home to America following the shipwreck, Moody–in the middle of revival meetings in Edinburgh–came and met them in London in order to offer consolation to his old friends. At that time he also urged Anna, as an antidote to her grief, to involve herself in his relief work back in Chicago, and on returning she did just that, taking charge of all of Moody’s women’s activities for the city. Years later, after Horatio’s death from malaria in 1888, Dwight L. Moody even came and visited the family in Jerusalem to once again offer comfort. (This, long after the Spaffords had departed from orthodox Evangelical theology–the very underpinnings of Moody’s ardent preaching.) Bertha Vester recalls: “I remember Mr. Moody’s coming to the American Colony in Jerusalem after Father’s death. He was a thickset, short, and highly emotional man, who always wore frock coats. With my sister Grace on his knee, he wept unashamed for the loss of his friend until two pools of water were formed on the floor by his tears” (Our Jerusalem). On a Hymnsong of Philip Bliss (1989) is Holsinger’s translated American hymn “It is Well with my Soul”. It is his largest selling work and has been used in several televised memorial performances in recent years, including commemorative services for the Challenger astronauts, Ronald Reagan, and the fallen heroes of the American armed forces. (2) Out of sheer curiosity, I saw how many “hits” the hymn title produced via searches on Google and YouTube, which, for better or worse, is seemingly the measure of anything’s importance in this day and age. Well, in each case it was 400,000-plus! At the risk of over-stating the point, this hymn is more widely known and deeply cherished than many people would ever imagine, especially those not steeped in the Protestant-Evangelical ethos (disclosure: I am). (3) In the course of researching this article, I encountered several on-line sources that mistakenly place the death of the Spaffords’ only male child, Horatio, in 1870 or 1871. 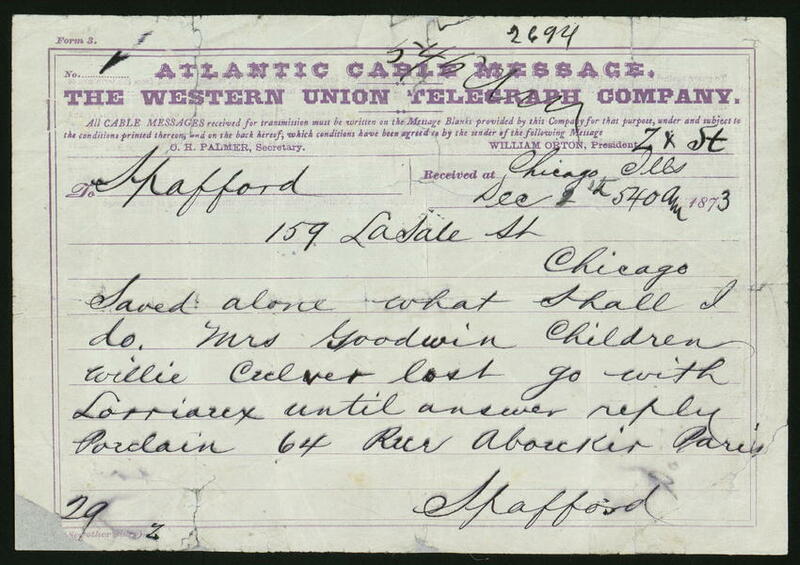 Four-year-old Horatio actually died in 1880, seven years after the shipwreck, of scarlet fever. Apparently, someone thought that by changing the date he/she could fashion a more dramatic narrative–as if that were possible. (5) On August 15th, 2015, I attended Garrison Keillor’s “America the Beautiful Tour”, which came to the Brevard Music Center here in western North Carolina. For any who may not be acquainted with his work and style, Mr. Keillor has hosted the weekly public radio variety program “A Prairie Home Companion”– two hours, live — for most of the past 25 years. Through his mix of homespun humor and music, always drawing heavily on his small-town Minnesota upbringing, Keillor displays a knack for tapping into quintessential, broadly-shared American experience. Anyway, the intermission of the show I attended had Garrison Keillor strolling the aisles, microphone in hand, leading the audience in singing a capella a host of well-known songs, and especially hymns. Of course, Horatio’s Hymn figured in the mix, two stanzas worth. I was not surprised. (6) Rather late in the game (2018), it has dawned on me (with some help!) the probable source of the titular phrase “It is well”, and, recalling that Spafford was steeped in the Bible, it should not surprise us to find its origins there, in scripture. Interestingly, the words are uttered by a biblical character who, like the Spaffords, had just had a young child snatched away by Death. The account is found in 2 Kings 4, in the cycle of Elisha stories: the tale of the Shunammite woman. Do you recall that she and her husband provided regular hospitality to the travelling prophet at their home at Shunam (probably modern Sulam, at the eastern foot of Moreh), going so far as to build him special quarters, and that Elisha promised that she, though advanced in years, would soon conceive and bear a son? She does, of course, the years pass, and one day the boy falls mysteriously ill in the field and is soon dead. That same day, the woman instinctively sets out for the prophet’s base on Carmel, and as she approaches, Elisha’s servant is sent out to inquire: “Is it well with thee? is it well with thy husband? is it well with the child? And she answered, It is well.” When she encounters the prophet, however, Elisha recognizes immediately that “her soul is vexed within her.” The rest of the narrative recounts the process of restoring the boy to life, ultimately through a kind of transfer-of-life ritual, and ending with Elisha’s instruction: “Take up thy son”. BUT, going back, what are we to make of the woman’s “It is well”–in the midst of her obvious turmoil and grief? Why the seeming disconnect? Was the woman lying? Was she covering up, trying to put a good face on things, to fool others–or herself, perhaps? OR… is it possible she indeed possessed some grounded, bedrock sense of well-being, one capable of transcending even the most dire circumstances? Well, one day I hope to be able to ask her. And Horatio. (7) Christmas, 2018. And on it goes… The Mormon Tabernacle Choir, as part of their holiday special televised on PBS, presented a 16-minute dramatized and musical version of the story of the Spafford family, Horatio’s famous hymn, and the impact of the American Colony in Jerusalem. Offered as an inspirational piece, the stage action is narrated live by British actor Hugh Bonneville. For all the tear-jerking sentimentality, it’s rather well-done and worth a look. This is one of a series of posts highlighting facets of American Colony history. For more background on the Colony phenomenon, see my on-line article “Jerusalem’s American Colony and it’s Photographic Legacy“. This entry was posted in American Colony, JERUSALEM, Jerusalem People, Religion, VIDEOS and tagged American Colony, D.L. Moody, Horatio Gates Spafford, Hymns, It Is Well With My Soul, Philip Bliss. Bookmark the permalink.